Twin-chamber forks have been used on many motocross bikes since 1995. They are found in both Upside-Down and Right-Side Up versions. 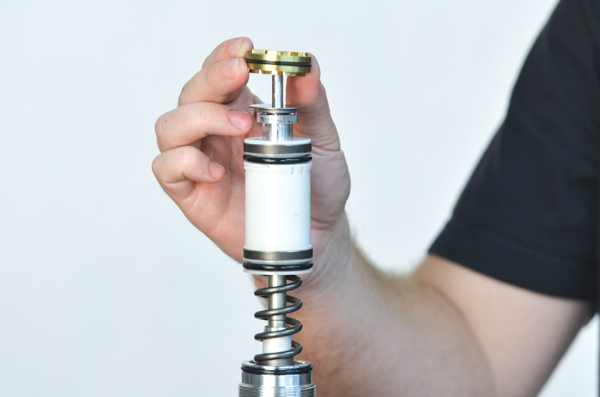 Note - Some WP forks have nitrogen bladders instead of pistons and pressure springs. These forks require special tools and procedures. 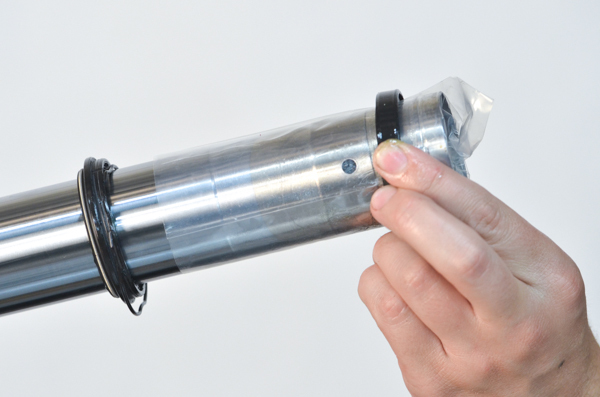 ►ClickHere for WP Bladder Fork assembly details. 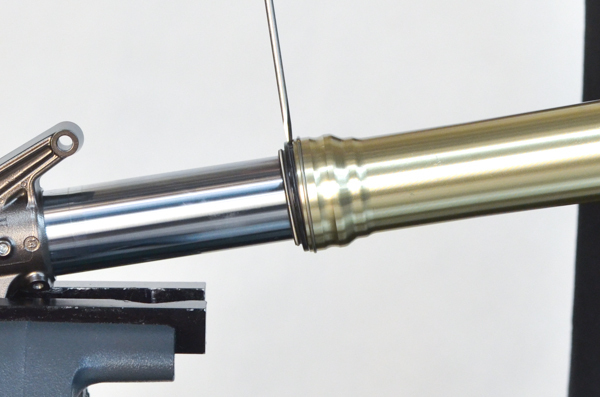 Great care must be taken on some models (early Showas with 12mm damping rods) because of the sharp edge on the thread at the bottom of the damping rod. 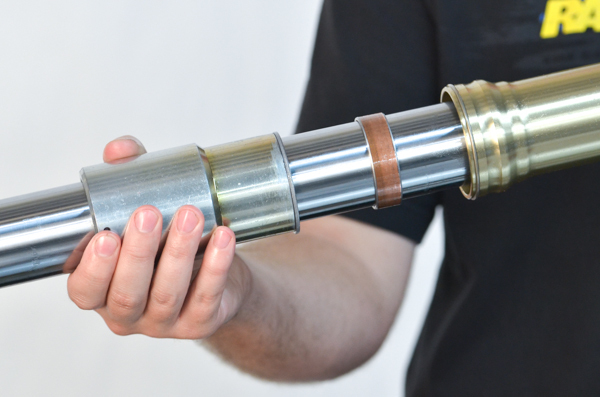 This can damage the cartridge seal during disassembly, resulting in lost damping. Featured, and special thanks to Master Suspension Technician Alan "AJ" Peck. 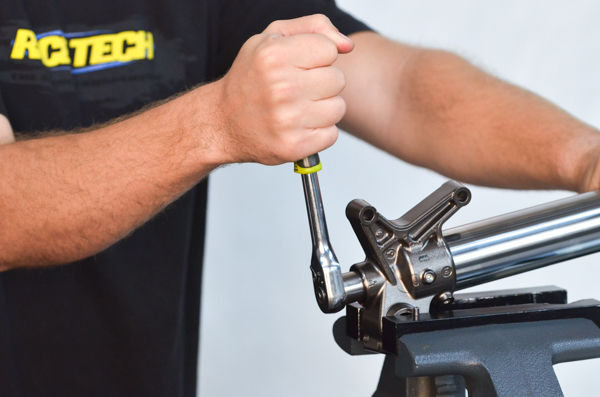 FD1- Place fork firmly in a vice at the lower triple clamp location and grab the correct fork cap wrench. 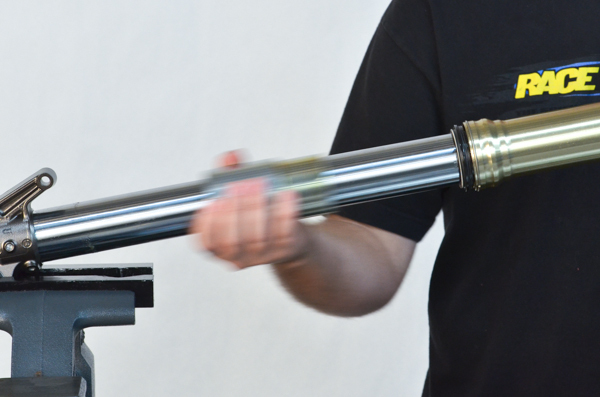 Be careful when clamping the fork tube as to not damage it. This is much easier with TMVJ 065 aluminum vise jaws. They have a large "V" and are very gentle to the tube while holding quite solidly. 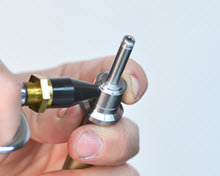 FD2- Loosen the fork cap with the fork cap wrench, but do not remove it completely. FD3- Pour out the oil and dispose of properly. FD4- Back off the rebound adjuster with a screwdriver. 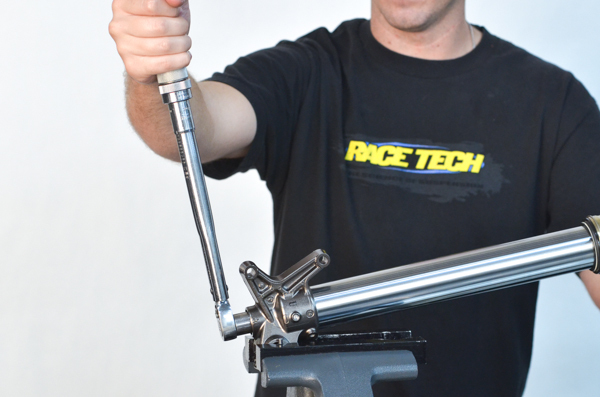 FD5- Loosen the damping rod bolt at the bottom of the fork. Do not use an air impact, just do it by hand. 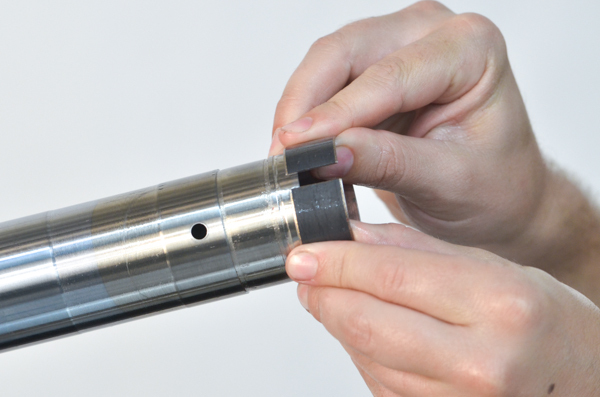 FD6- Compress the outer tube and insert a holding clip tool (TFHP 01) on the damping rod. 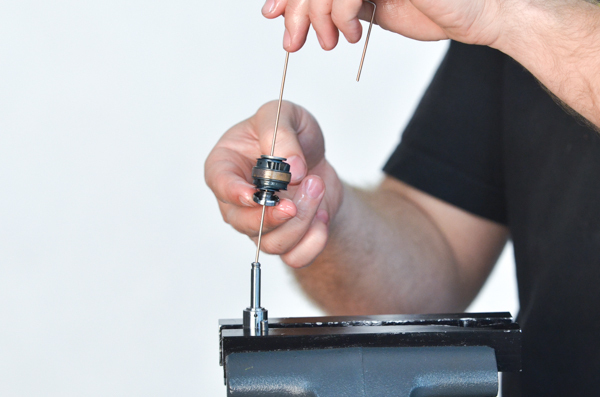 FD7- Loosen the jam nut and remove the damping rod bolt. 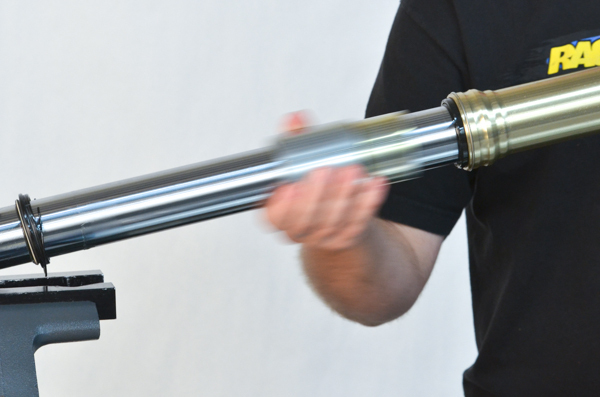 FD8- Here's a close up of the damping adjuster rod. 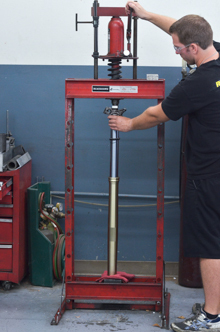 FD9- Remove the damping adjuster rod. FD10- Compress the fork and remove the clip tool. FD12- Inspect the cartridge for damage such as dent, wear, etc. FD14- and it should return to the extended position by itself. 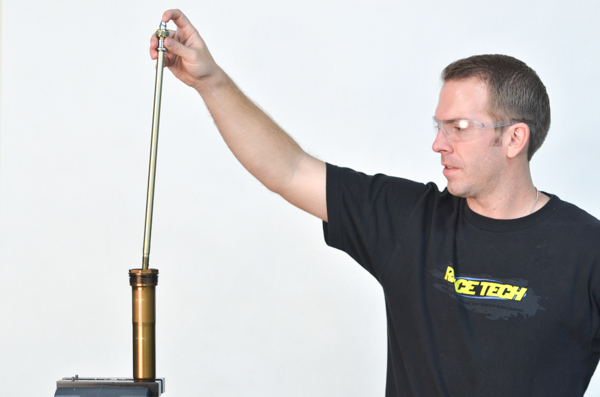 If it doesn’t, the internal oil level is low, possibly caused by leaking shaft seals or incorrect assembly. 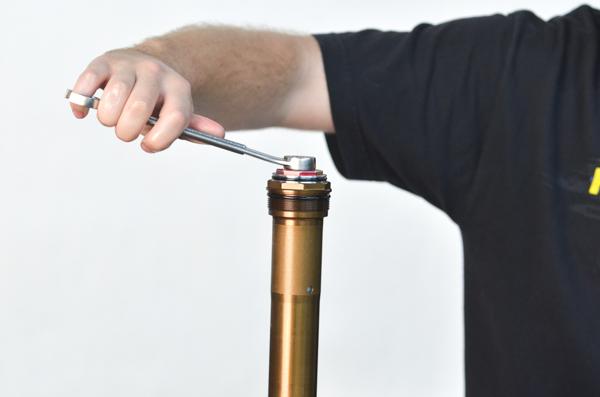 FD15- Remove the spring from the fork tube. 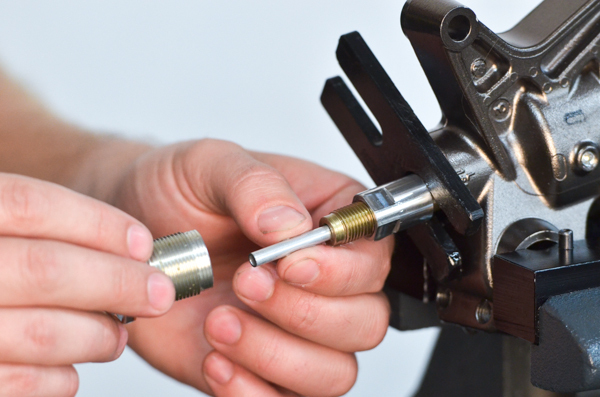 Steps FD16 through FD27 only need to be done if you are doing a complete service and are replacing Seals and Bushings. FD16- Gently remove the wiper with a flat screwdriver. FD17- Remove the seal retainer clip with a clip tool (TSCP 01). FD18- Slide hammer the fork seal and bushings out forcefully. 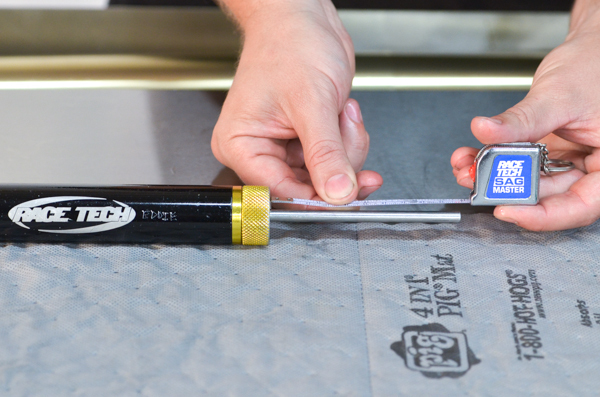 FD19- Tip: You may need to heat the seal/bushing area if the tubes don't come apart easily during slide hammering. Try slide hammering after heating the specified area. 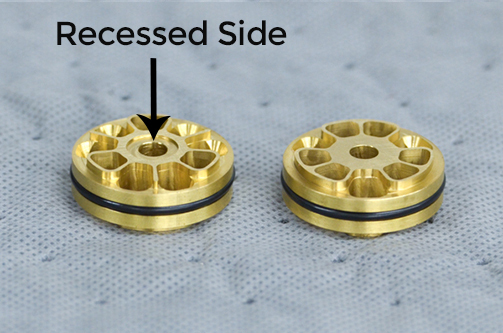 FD20- Some forks may suffer damage to the Teflon bushings during disassmebley (as shown). Its good to have replacement bushings on hand, just in case. 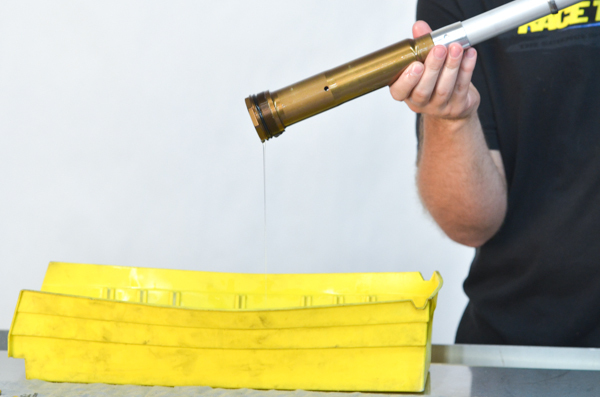 FD21- Another way to remove the seal with a minimal chance of damage to the bushing is to completely fill the fork with used oil, invert it, remove the wiper and clip, and put it into hydraulic press to force the seal out. This seems like it could be a big mess but if the fork is completely full and there is no compressable air space, the seal pushes out and a small amount dribbles over the edge. 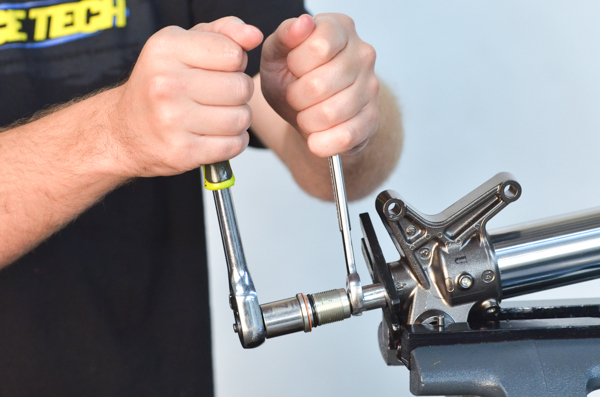 FD22- Remove the inner fork bushing with a screwdriver or fingernail. Fingernails are better if you have the strength. 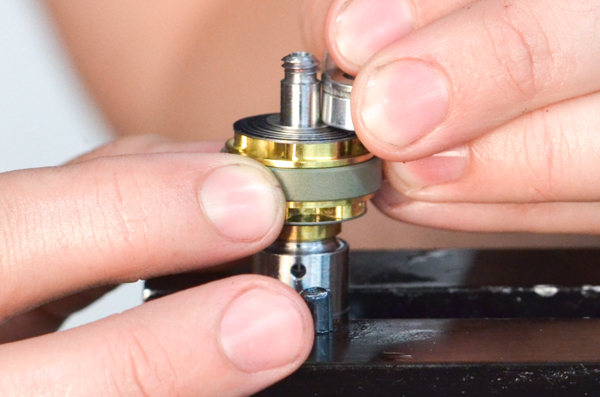 FD23- Remove the bushings and the seal washer. 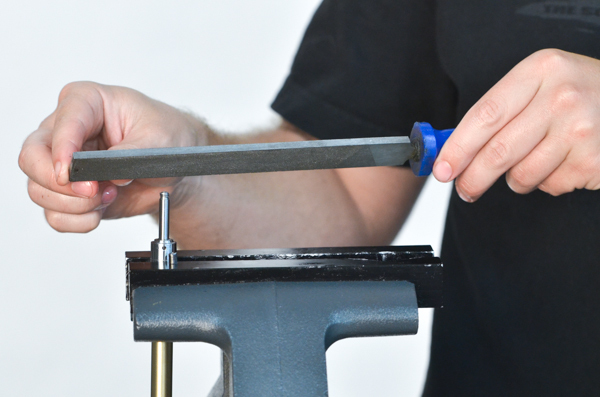 FD24- If you're not replacing seals, use blue painters tape to cover the sharp edge of the bushing groove during removal. 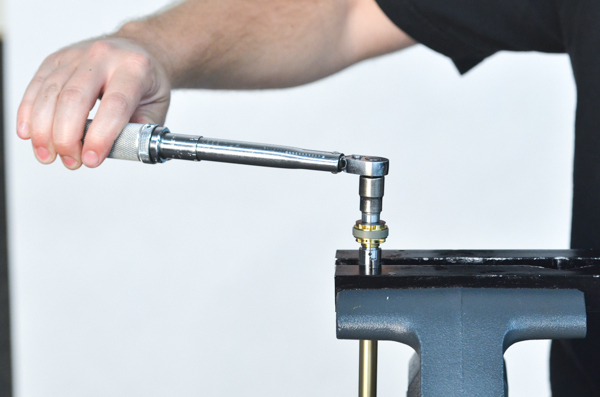 FD25- Inspect the bushings for damage, including worn-down Teflon* or embedded material. 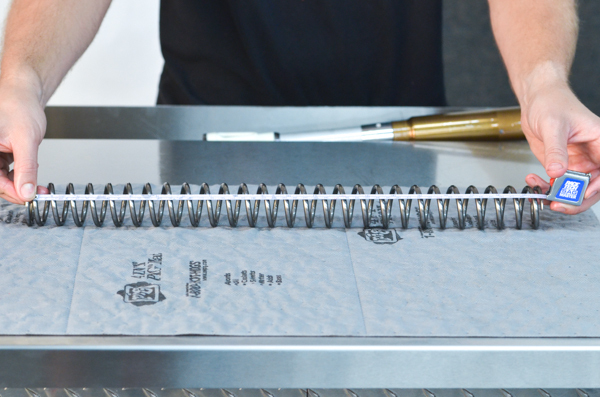 *Teflon it a Trademark of Dupont Corp.
FD26- Inspect the fork tube for pits, dings, and straightness. Come on AJ, you can look closer than that! 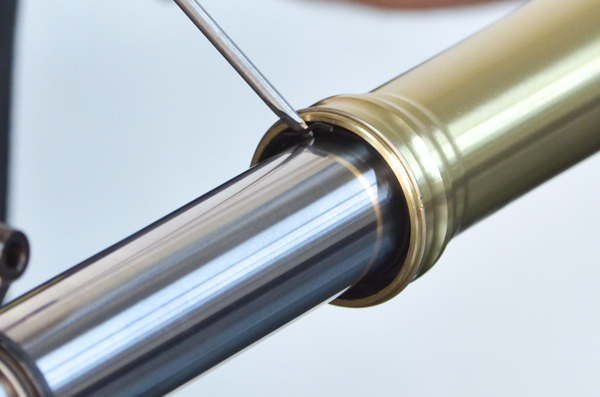 FD27- Inspect the condition of the hard anodizing, looking for wear inside the outer fork tube with an inspection mirror and flashlight. You might be suprised how often this is worn through. If it is the fork will be way harsher than it could be. 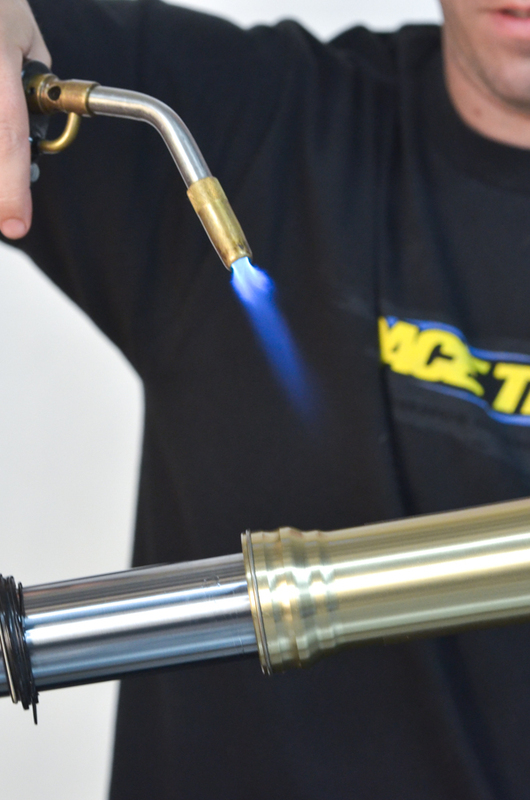 Give us a call - we can re-anodize. 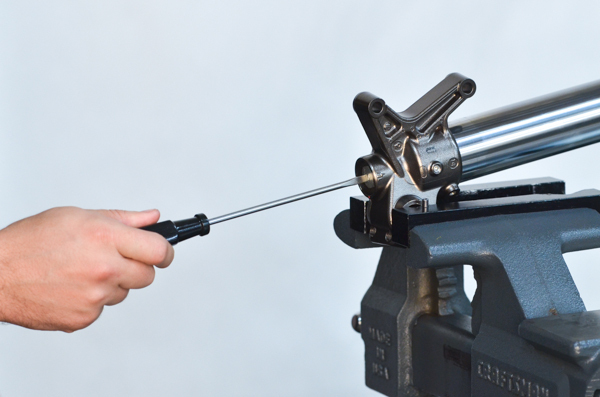 CD1- Gently hold the cartridge in a vise and unscrew the compression assembly. 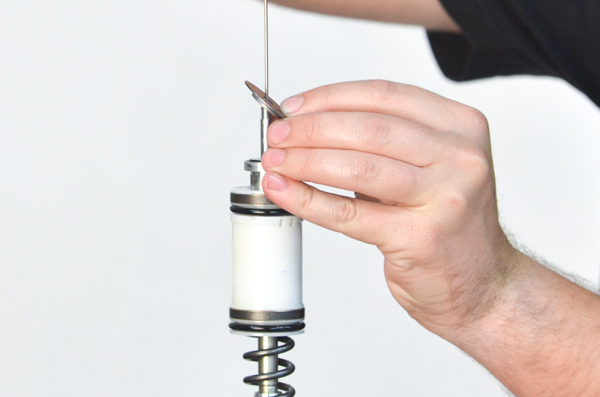 CD2- Compress the damping rod to lift the compression assembly. CD3- Remove the compression assembly. 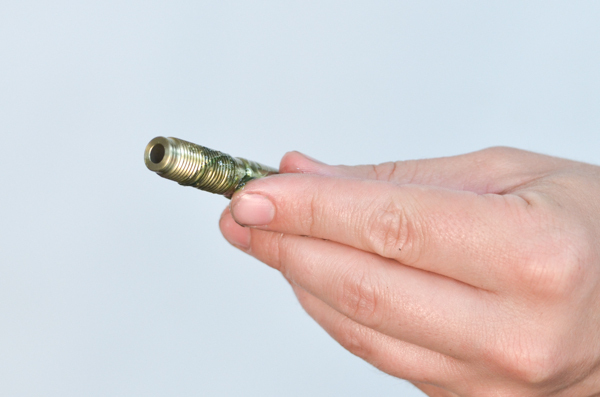 CD4- Empty the oil from the cartridge and dispose of properly. 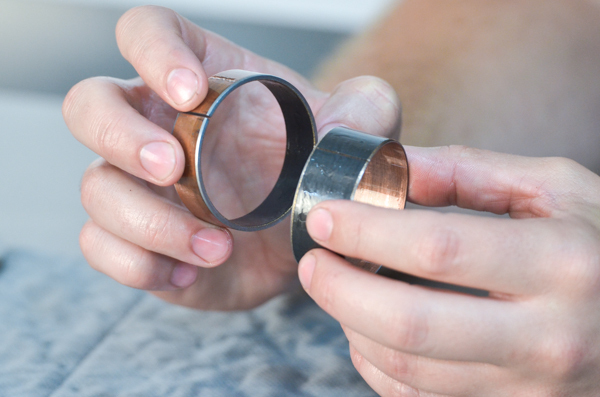 ►ClickHere for Gold Valve Installation Instructions List. 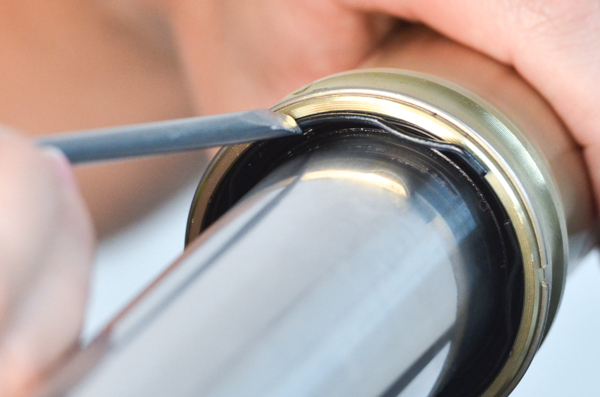 VC1- File the peening from the top of the compression shaft down to the nut surface. Some models like WP and Ohlins don't require this step. 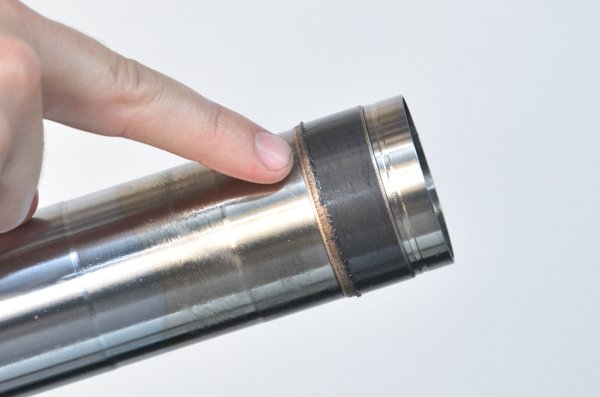 VC2- The top of the compression shaft should line up with the nut's surface after filing (as shown). VC3- Remove the compression valving nut. VC4- Remove the compression valving assembly. 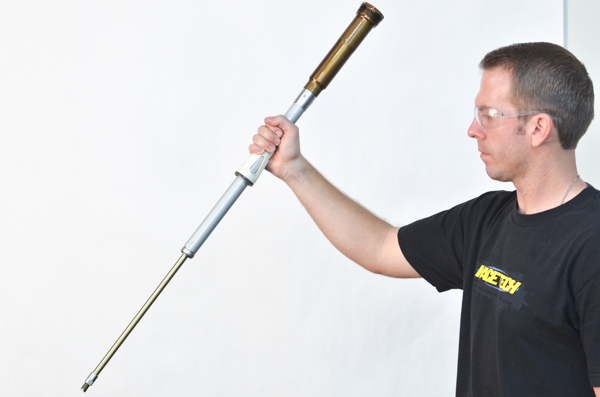 It can be helpful to use a welding rod bent into a special tool or a small screwdriver. 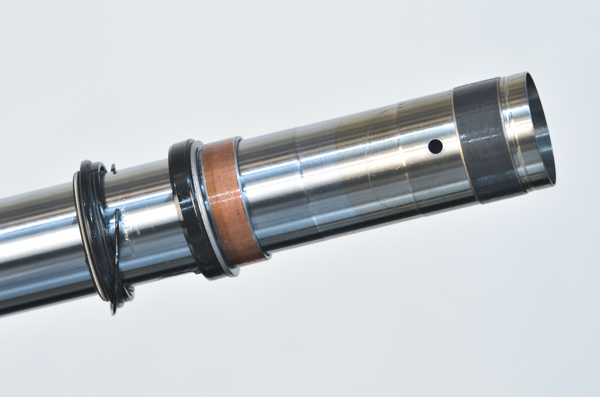 VC5- Chamfer the end of the compression valving shaft with a fine, flat file. VC6- Blow air through one of the side holes while covering up the other side hole. 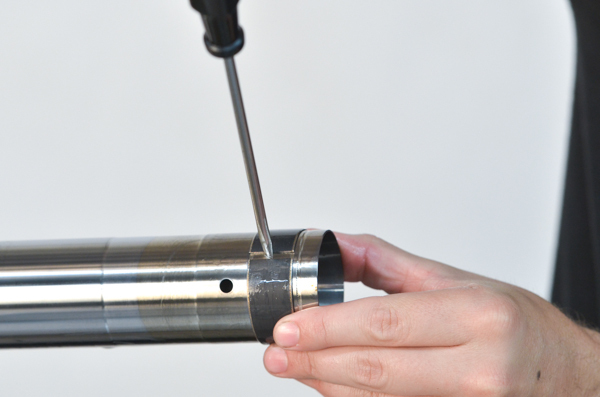 This allows any fillings that may be in the shaft to be removed through the top hole. 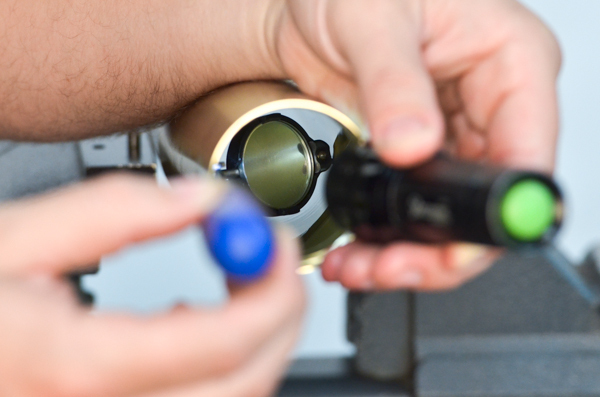 VC7- If you are replacing the pressure spring or reservoir piston seal, you must disassemble the reservoir. 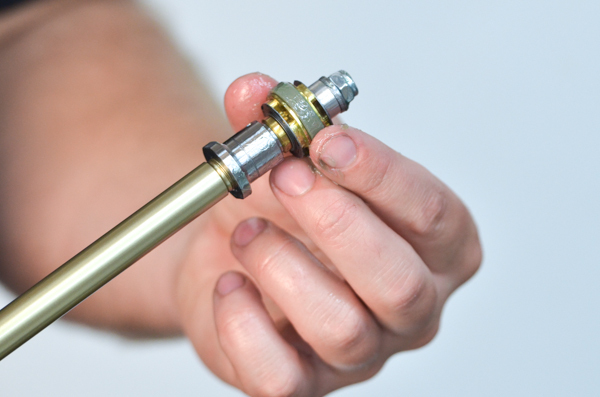 VC7 through VC11 only needs to be done if you are servicing the Reservoir Piston or replacing the Compression Post or Compression Holder. VC8- Disassemble the reservoir and Compression Rod. 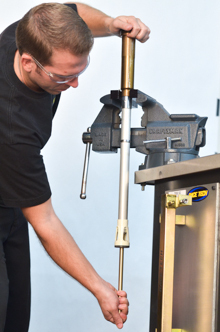 Note - Stainless Steel Compression Rods are available for SX and Freestyle applications. VC9- Inspect all the parts for wear. 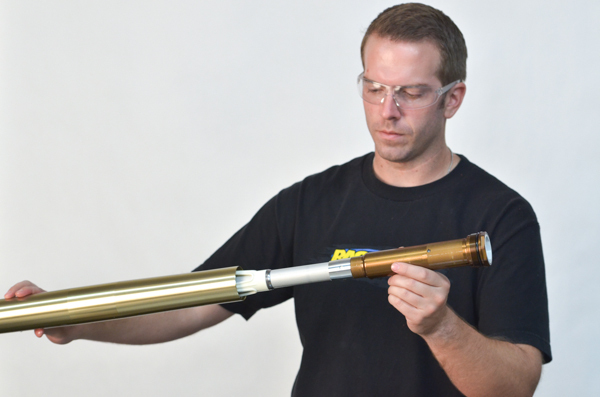 Some models with aluminum shafts have severe wear problems. 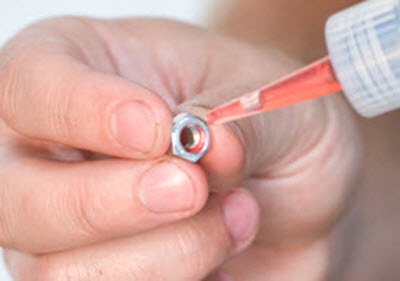 VC10- Add a small drop of Hi-Strength Loctite to the compression valving holding thread. 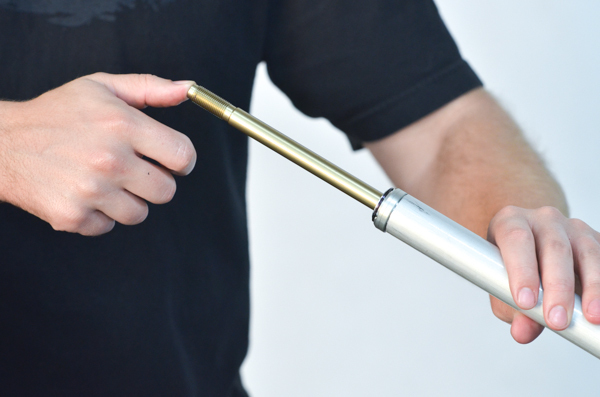 VC11- Install the pressure spring, reservoir piston, and compression valving holder. VC16- Install the compression stack. 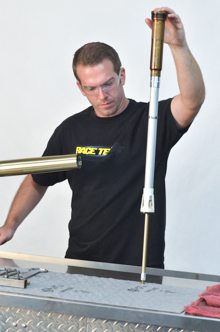 Consult the instruction sheet that comes with the Gold Valve Kit for specific procedure. See the DVS Setup Sheet for valving recommendations. 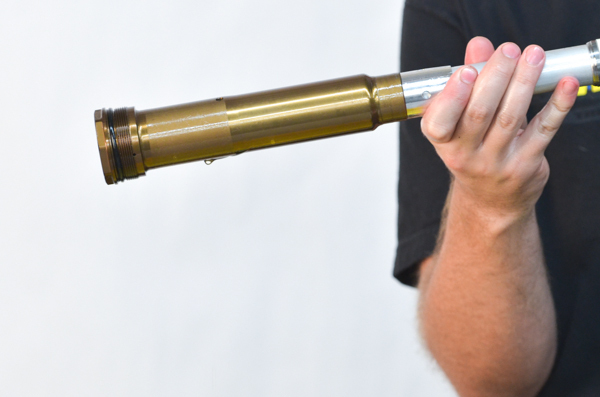 VC17- Check the condition and flatness of the piston. They are surfaced during the manufacturing process. 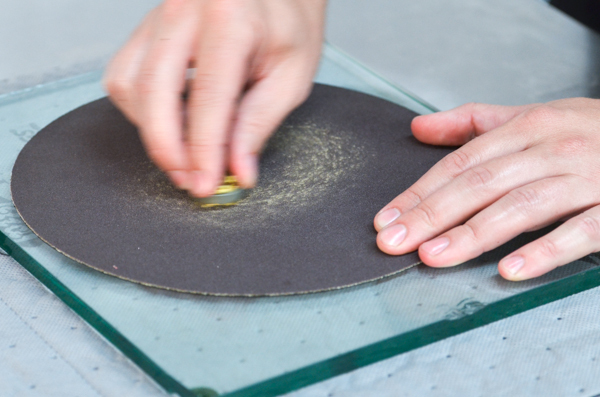 When in doubt smooth the faces of the Gold Valve using 320 grit sandpaper on a flat surface plate or thick piece of plate glass. Press down firmly. 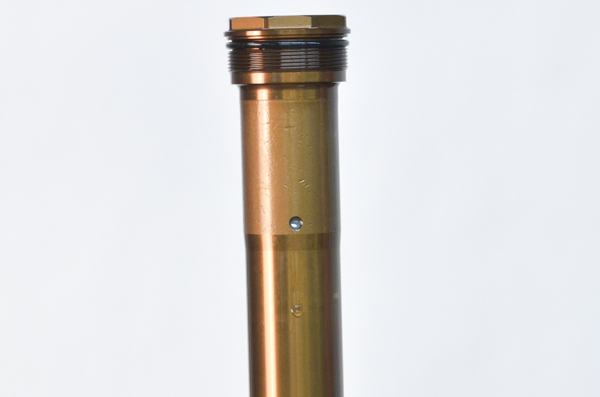 VC18- Install the Race Tech Gold Valve. The recessed side goes up. VC19- Install the check plate. Be careful that it moves freely when installed. VC20- Set the proper total stack height so that the nut gets full engagement and doesn't run out of thread. Incorrect stack height is shown in this photo (this stack is too short). 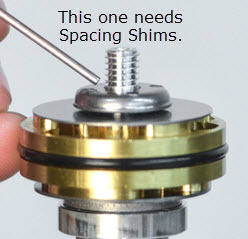 If you need to add to the total stack height add extra shims below the bottom compression shim (the clamping shim) that are larger than the clamping shim and smaller than the base plate. VC21- Correct stack height. 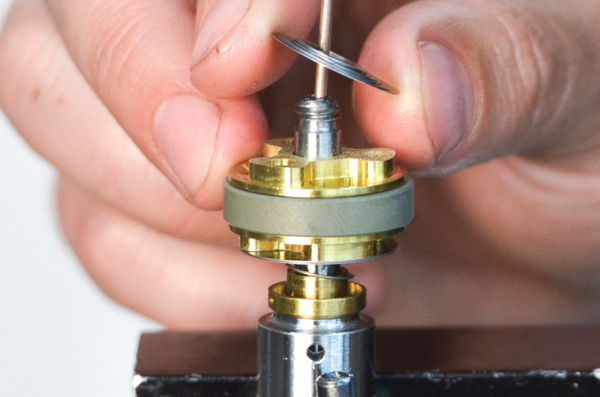 The Base Plate "straddles" the step at the bottom end of the thread. Click to enlarge. 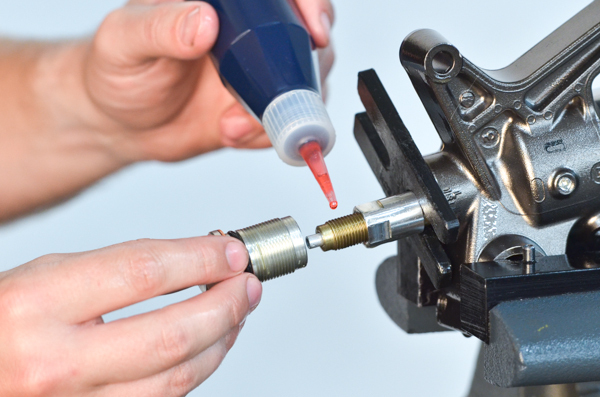 VC22- Apply a small drop of Loctite to the compression valving shaft nut. 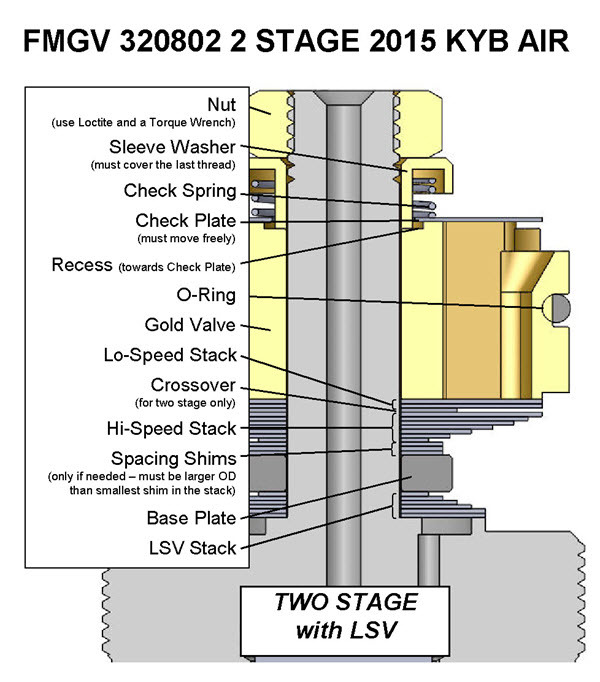 VC23- Check to make sure the check valve is free. VC24- Torque the compression valving shaft nut to the spec recommended on the DVS Setup Sheet. This is critical! VR1- Continue disassembling the cartridge. 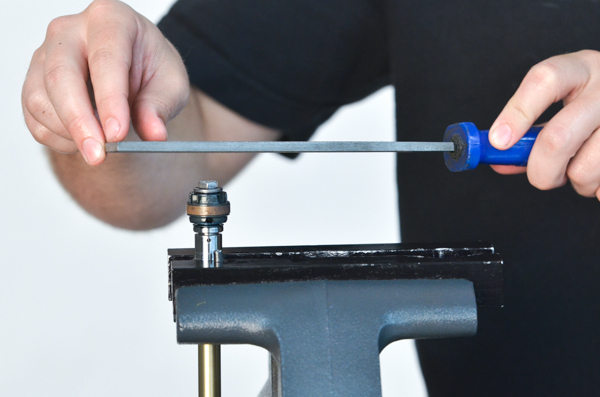 Remove the damping rod jam nut. 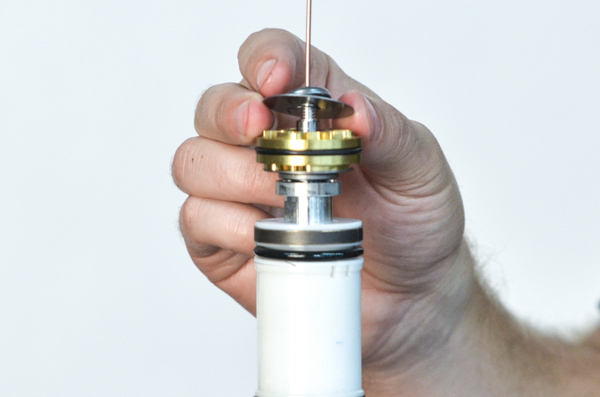 VR2- Push the damping rod out through the seal. Note: This is the step that can damage early Showas with 12mm damping rods. Feel for sharp edges on the top end of the thread. Carefully and lightly file the sharp edge. It may be helpful th pack the thread with grease before pushing it out past the seal. Seals are available at RT for most models. 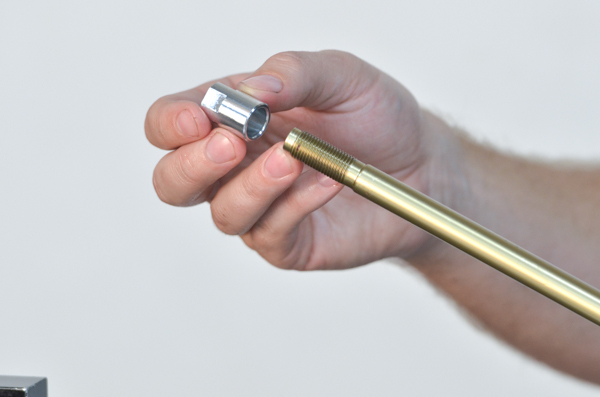 VR3- Put the rebound rod in the shaft holding tool and remove the peening by filing it down to the nut face. 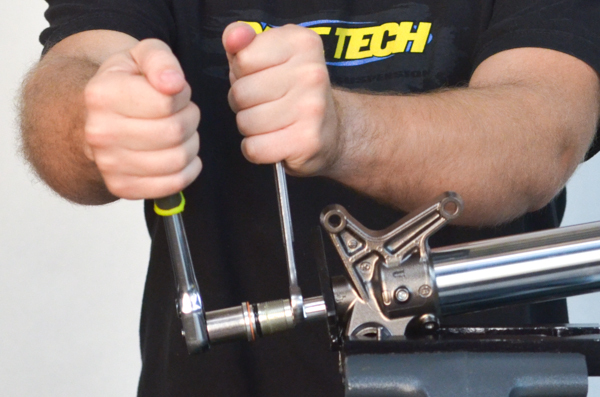 This step is not required on WP and Ohlins. VR4- Remove the rebound valving nut. VR5- Remove the rebound valving assembly. 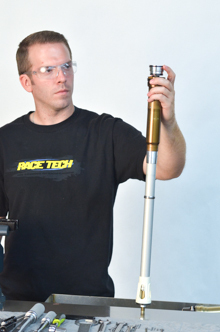 VR6- Chamfer the rebound valving shaft lightly. 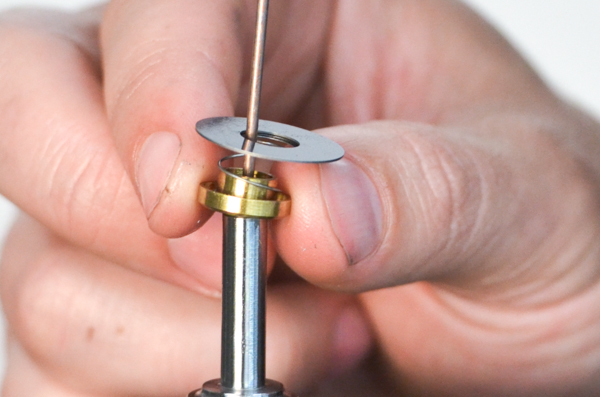 Use a wire wheel on the shaft end to smooth it. VR7- Blow air through one of the side holes while covering up the other side hole. This allows any fillings that may be in the shaft to be removed through the top hole. 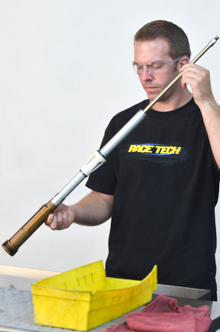 VR8- Inspect the rebound rod for pits, wear, bends and worn-through anodizing. 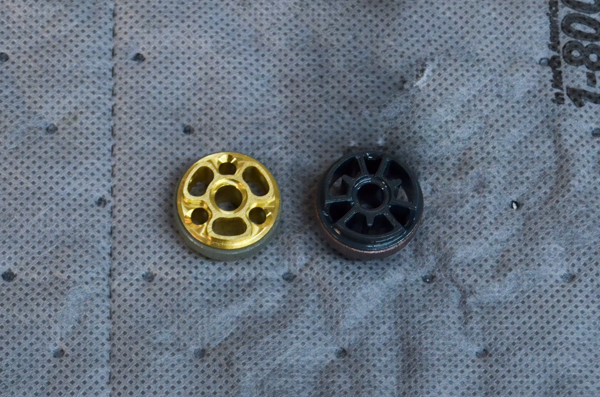 VR9- Rebound stack laid out along with a Race Tech Gold Valve. 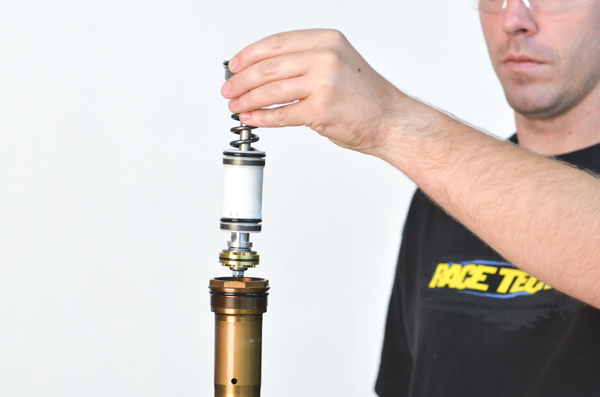 VR10- Comparison between the stock piston and a Race Tech Rebound Gold Valve. VR11- If required surface the rebound piston on 320-grit sandpaper. 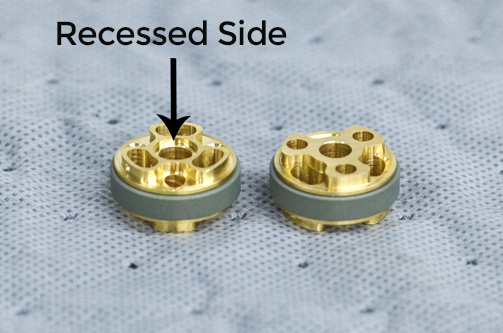 On the side with the recess be careful not to remove much material as the depth of the recess affects the mid-valve float. 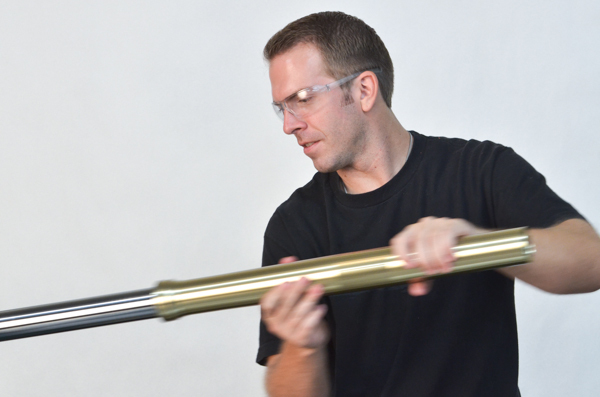 See the Rebound Gold Valve Installation Instructions for details. 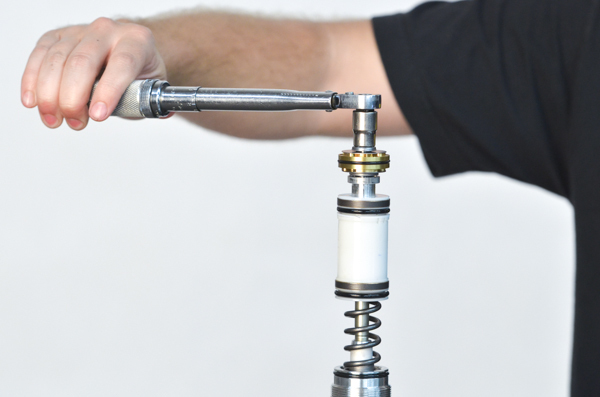 VR12- Install the sleeve washer and mid-valve valving stack on the valving holder. Consult the instruction sheet that comes with the Gold Valve Kit for specific procedure. See the DVS Setup Sheet for valving specs. 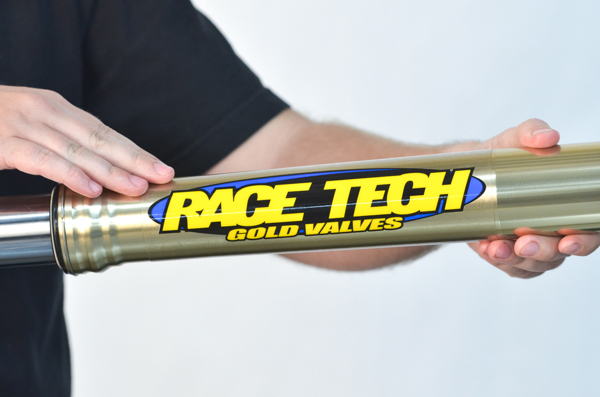 VR13- Install the Race Tech Gold Valve with the recessed side down. VR14- Install the rebound valving stack. 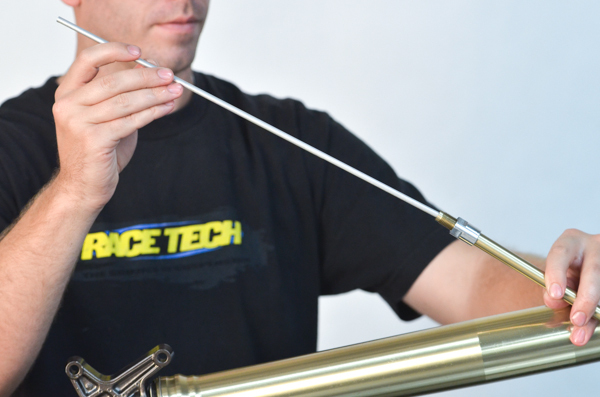 Consult the instruction sheet that comes with the Gold Valve Kit for specific procedure. 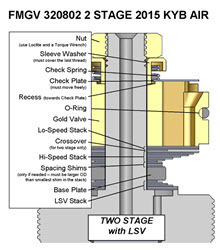 See the DVS Setup Sheet for valving. VR15- Make sure the valving stack height is correct. 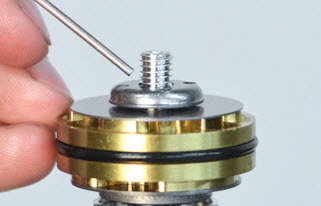 The nut should have full engagement, but doesn't run out of thread onto straight shaft. 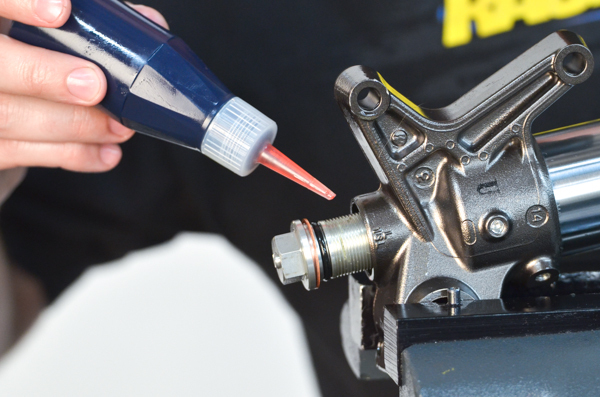 VR16- Apply a small drop of Loctite onto the rebound valving nut. 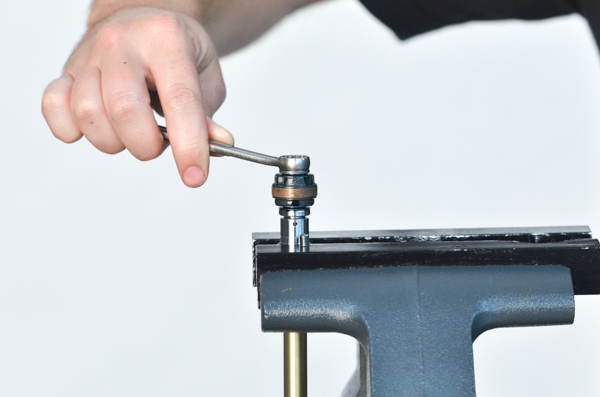 VR17- Make sure the mid-valve/check valve is free to move up and down. 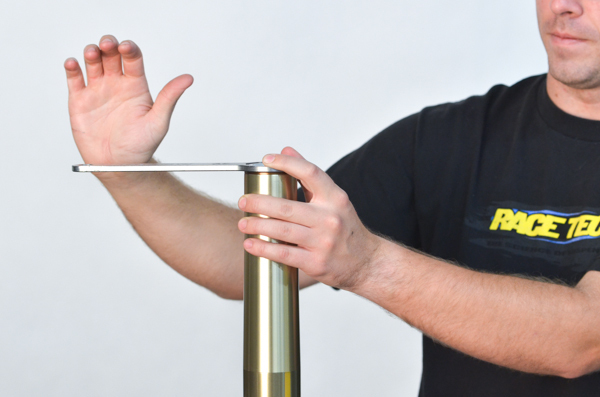 Use a feeler guage to check the "Float". This is one of the most critical parts of the setup! 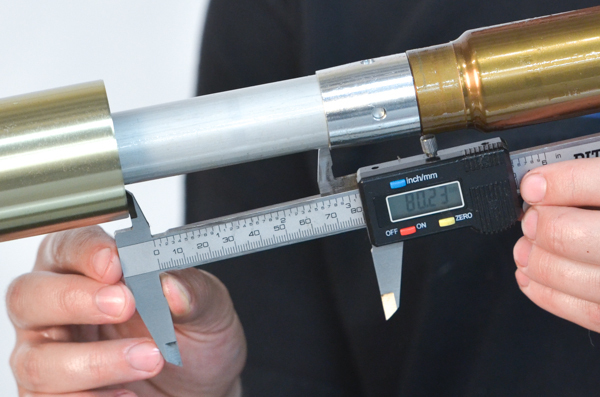 Production tolerances of shim thicknesses, recess depths, etc. can easily add up in the wrong direction making it either too tight or too loose. Adjust the Packing Stack to get the proper Float!!!!!!! 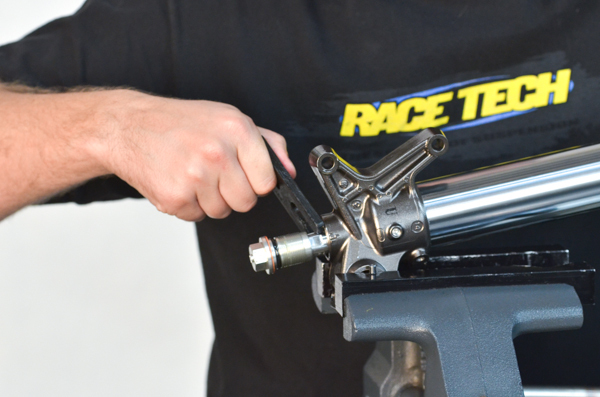 VR18- Torque the rebound valving nut to the spec on the DVS Setup Sheet. 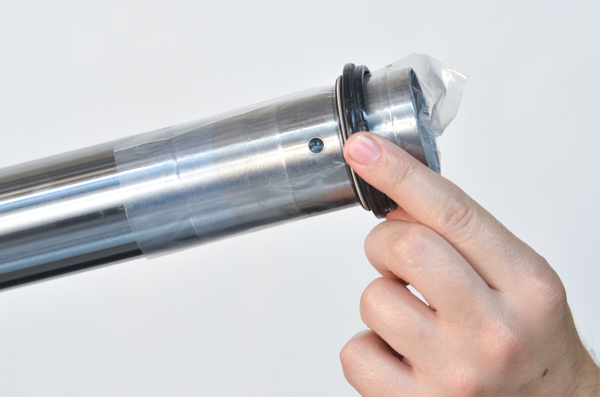 CA1- Fully pack the rebound rod thread with grease. 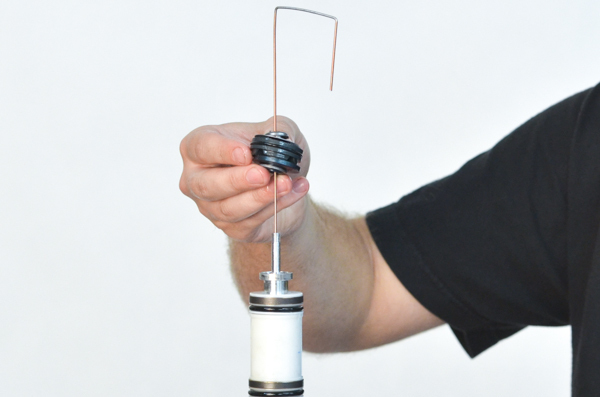 CA2- Install the Piston Ring if not already installed. Curl it up tightly before it is installed. If you need to you can use a little grease to hold it in place. CA3- Insert the rebound rod into the cartridge. 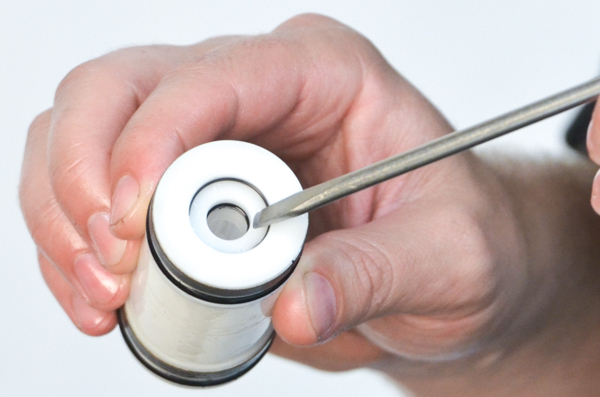 CA4- Quickly push the end of the damping rod through the seal using a T-handle. CA5- Fill with USF-05 fluid about 100mm (4") from the top. 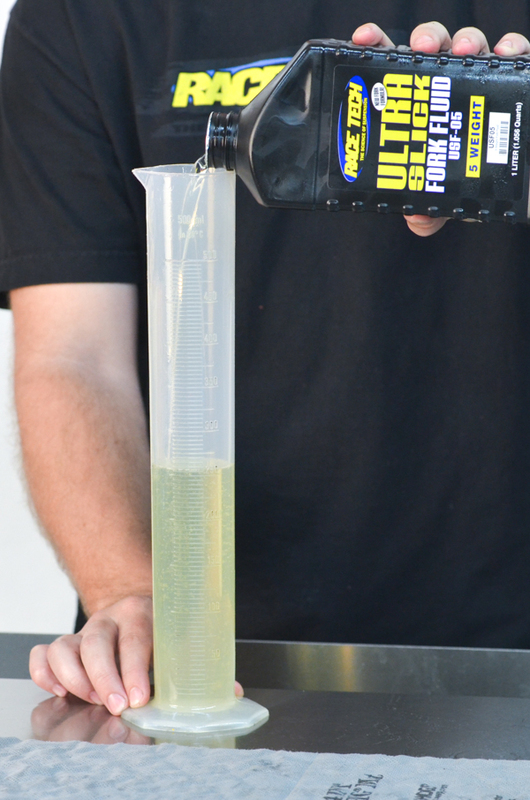 We realize USF-05 is not the cheapest fork oil on the market but please try it. It significantly outperforms the other brands. You will notice a big improvement in stiction. 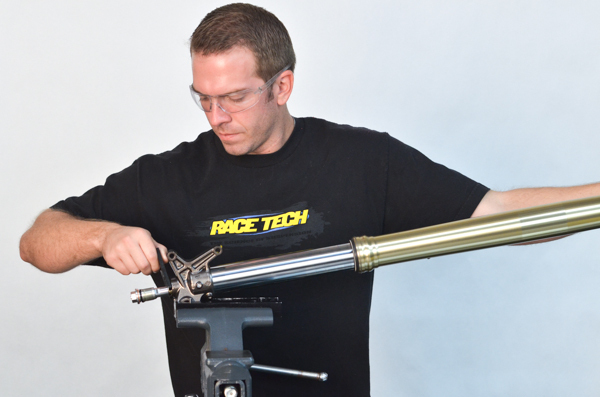 If you really want to test it compare it back-to-back out at the track. 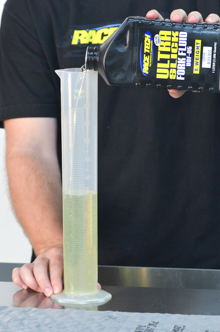 Do your best to completely drain the old fluid as it can contaminate the new USF-05. 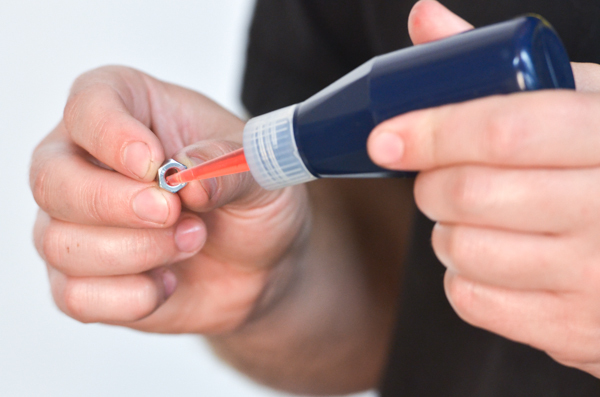 CA6- Bleed the cartridge by pumping the rod in and out. Make sure you stroke it slowly on compression to prevent cavitation. 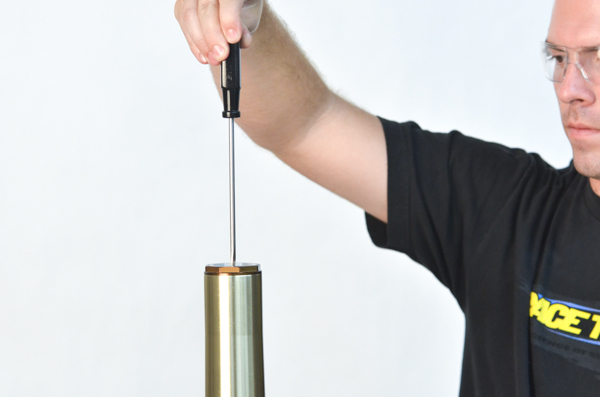 CA7- Replace the damping rod jam nut and set the oil level to about 100mm with a fork oil level tool (TFOS 02). CA8- This amount of oil is actually too much. The excess will automatically be removed further in the procedure. 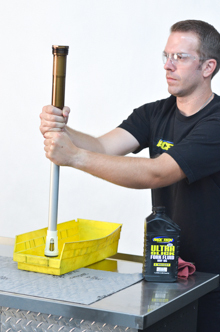 This pic shows setting the Oil Sucker height on the tool itself. CA9- Insert the compression valve assembly into the cartridge. CA10- Push down on the compression assembly and tighten. 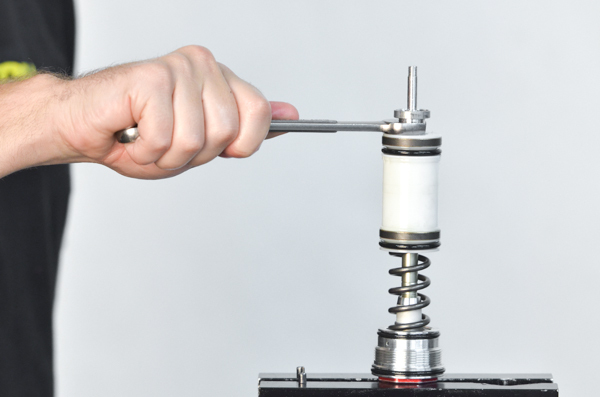 This will take a bit of force to compress the Pressure Spring. You wil hear oil being released past the reservoir piston. CA11- Install the damping rod jam nut all the way on. 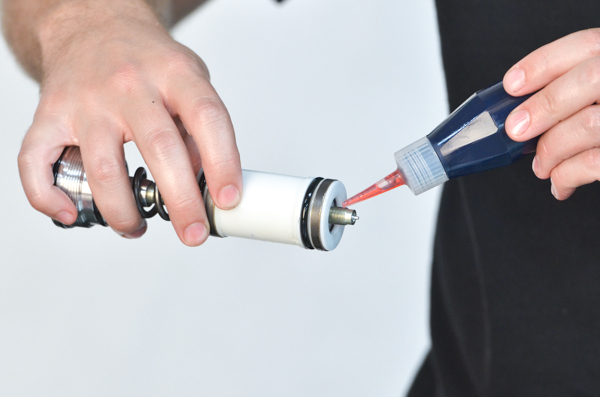 CA12- Set the final oil volume by compressing the cartridge all of the way. 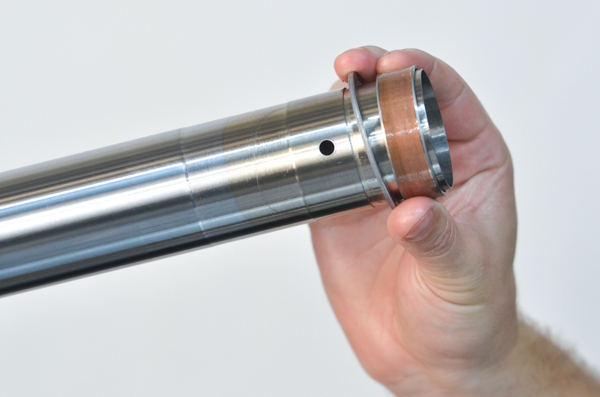 The reservoir piston will move up until the piston no longer seals on the shaft where the "necked-down" portion of the shaft is. 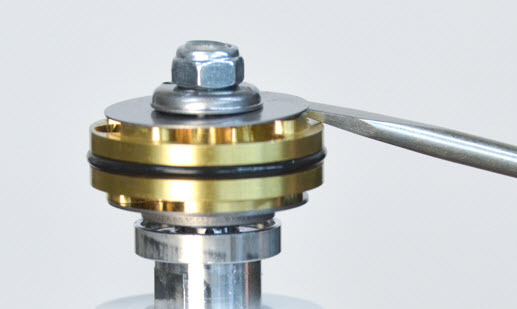 On KYB the pressure release is on the OD of the Reservoir Floating Piston. WP Bladder Style forks require a special procedure. CA13- Extra oil will go past the reservoir piston and will drip out of the vent holes. 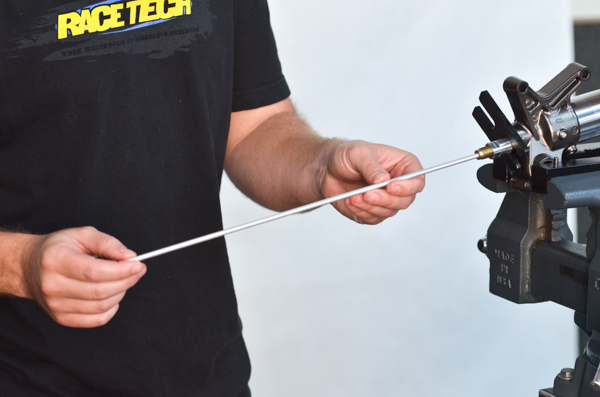 CA14- Release pressure and make sure the rod extends completely. 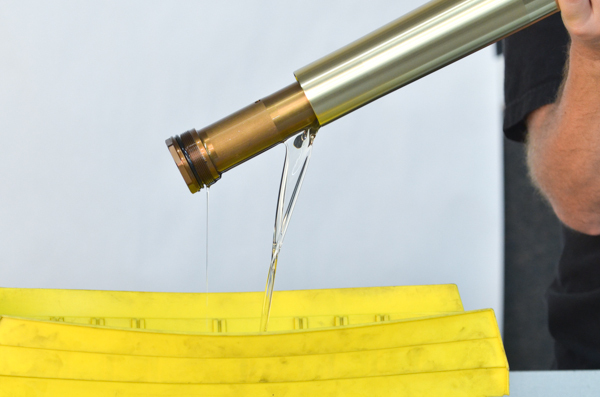 If it does not it usually means there is not enough oil in the cartridge. 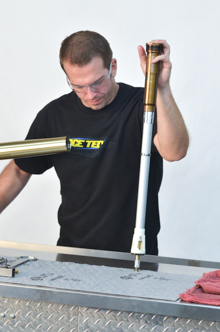 It could also indicate that something is bent or installed incorrectly. 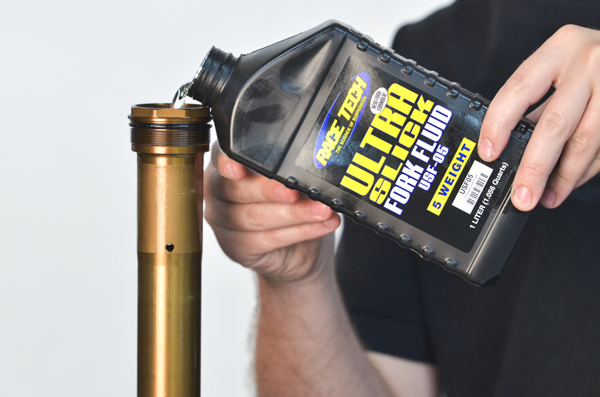 FA1- Grease the fork seal and wiper with Ultra Slick Grease (USSG 01). 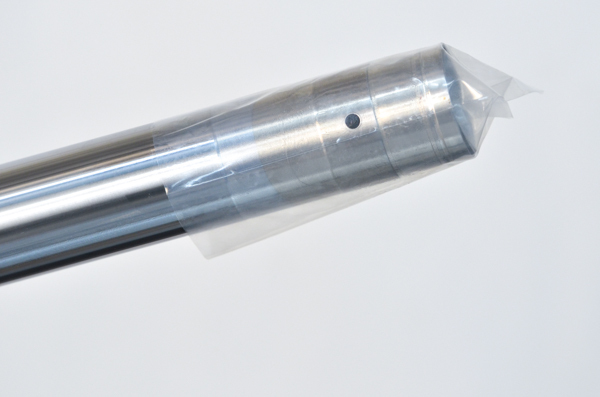 FA2- Use the corner of a heavy guage plastic bag and place it on the end of the fork tube. 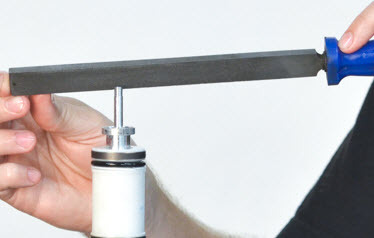 This will prevent the seal from sharp edges. FA3- Slide on the dust seal. FA4- Slide on the retaining clip and oil seal. 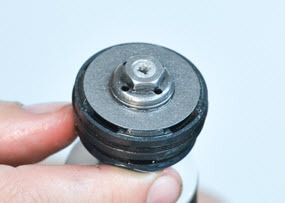 FA5- Install the seal washer and outer bushing. 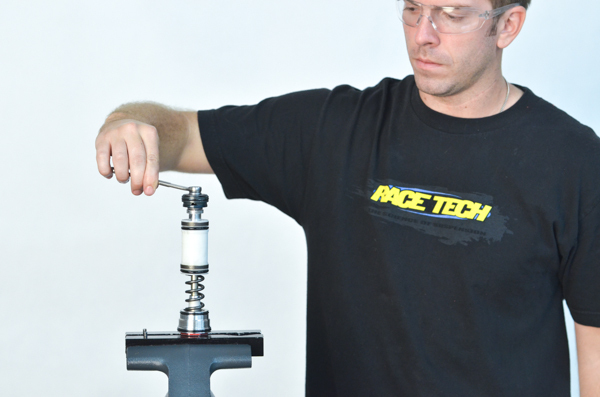 FA6- Install the inner bushing into its groove. 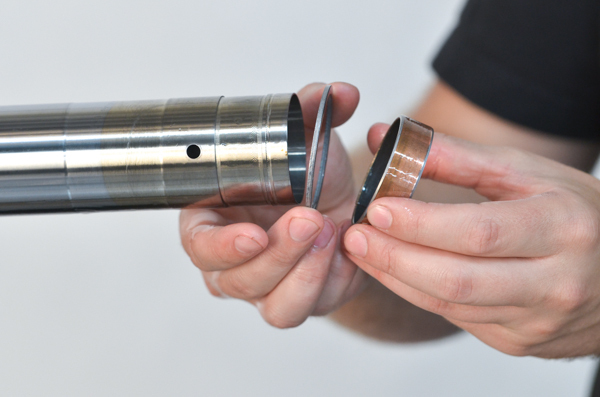 FA8- Install the outer bushing with a seal driver. You will hit the seal washer and it will drive in the bushing. 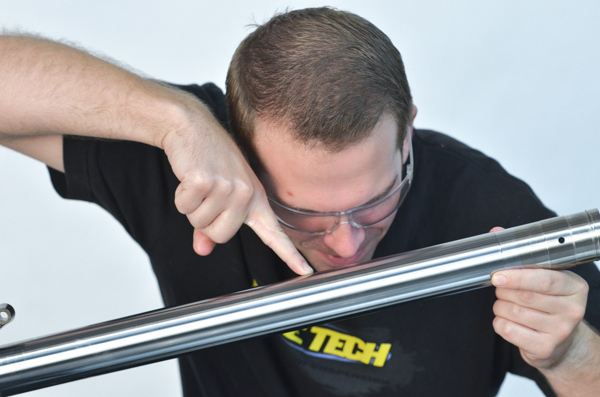 It is best to slide the fork tube against a stationalry Seal Driver. 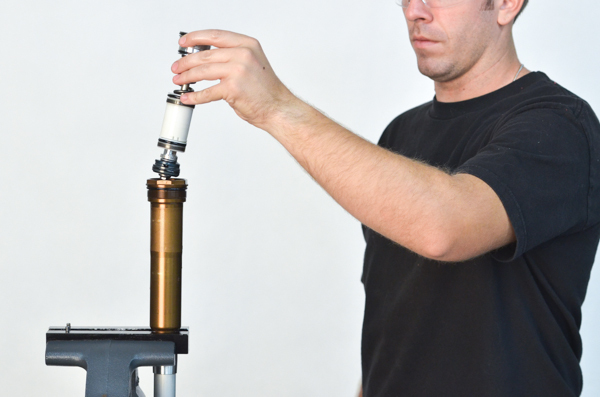 FA9- Install the oil seal with the same method of holding the seal driver stationary and moving the fork tube. FA10- Install the clip into the groove. FA11- Install the dust seal. FA12- Insert the rebound adjusting rod. On most Showas this is a "D" shaped rod that must register in a male pin inside the rod. On WP and KYB it is a round rod. FA13- During re-assembly we'll calculate the preload. 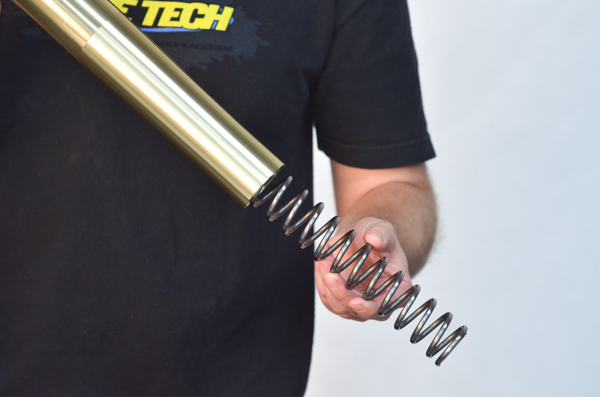 Measure the spring free length. 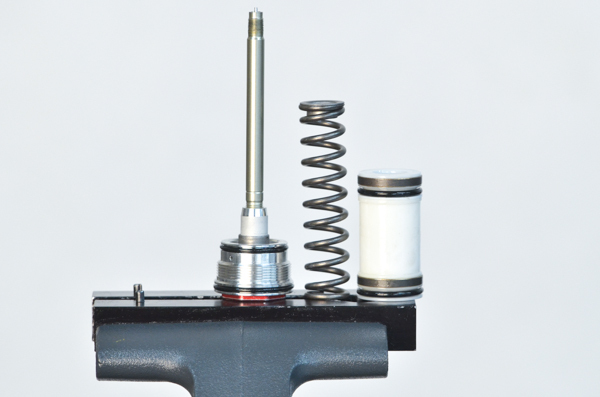 FA14- Slide the spring onto the cartridge and insert it into the fork tube. FA15- Gently rest the cartridge on the spring. 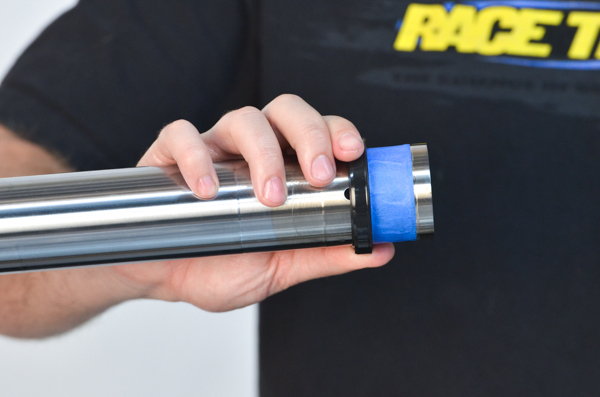 Make a reference measurement between the end of the bottomed-out fork tube and any easliy identified edge on the cartridge. 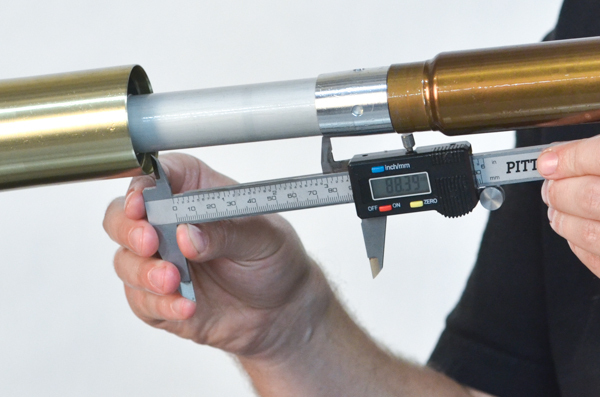 This measurement will be drawn in when the bottom bolt is installed by the amount of the preload. 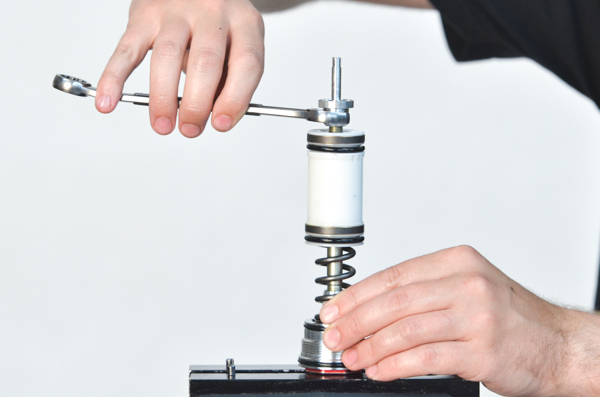 FA16- Compress the spring and insert the clip tool. You can't see it in this picture but he is pushing on the cap end of the cartridge with his left hand. 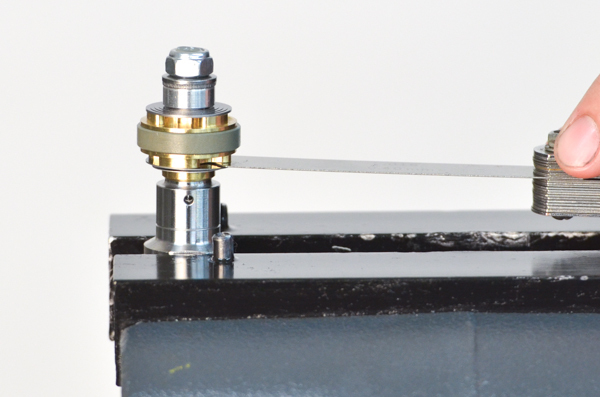 FA17- Put a drop of Loctite on the damping rod thread. FA18- Tighten the jam nut. FA19- Compress the fork and remove the clip tool. FA20- Put a drop of Loctite on the adjuster bolt. 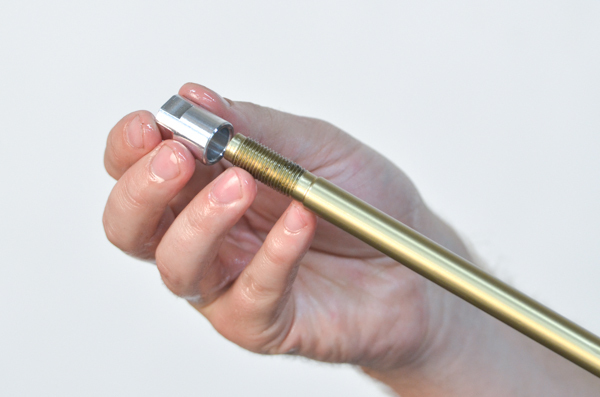 FA21- Tighten the adjuster bolt with a torque wrench to manufacturer's spec. No air tools. 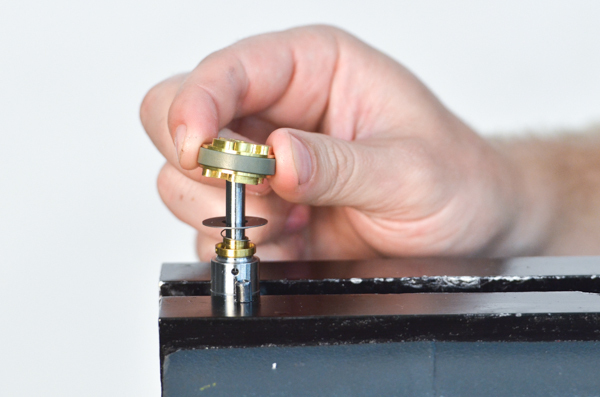 FA22- Now that the cartridge is tightened, the spring is compressed to the set length. Re-measure the reference distance. Subtract this distance from the first measurement, this gives us the preload. The set length can be calculated if you are interested - it is the free length minus the preload amount. 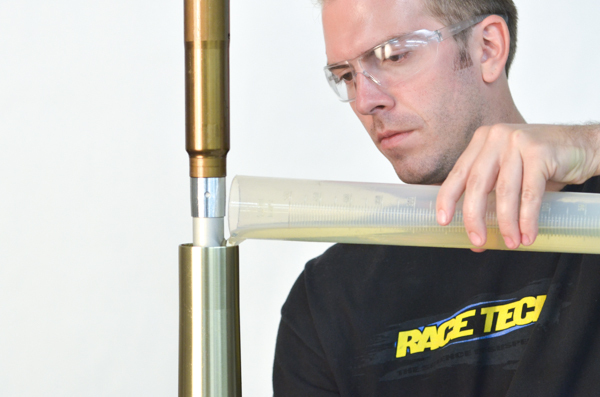 FA23- Measure oil volume with a graduated cylinder (TFGC 500). 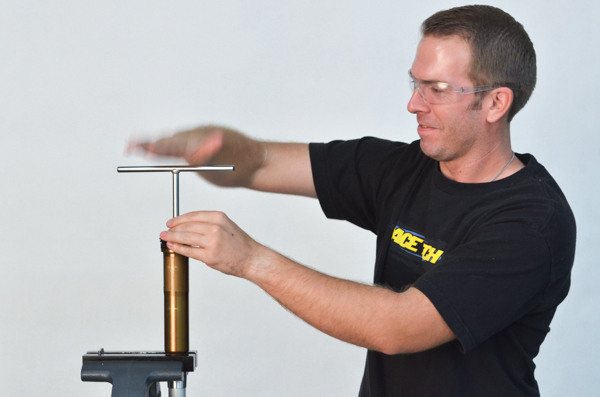 FA24- Pour oil into the open fork tube. 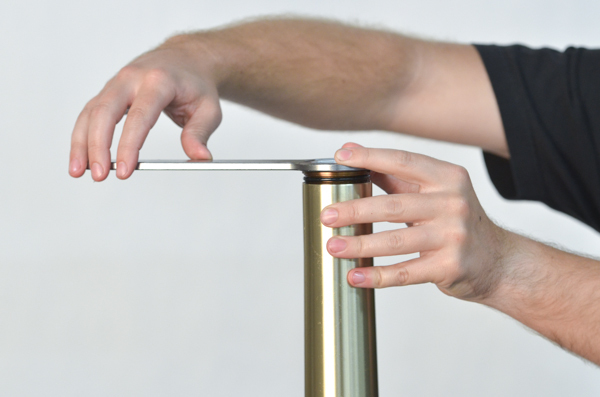 To be accurate with oil level let the graduated cylinder drain completely so there is very little residual oil in it. FA25- Tighten the fork cap snugly but not too tight. 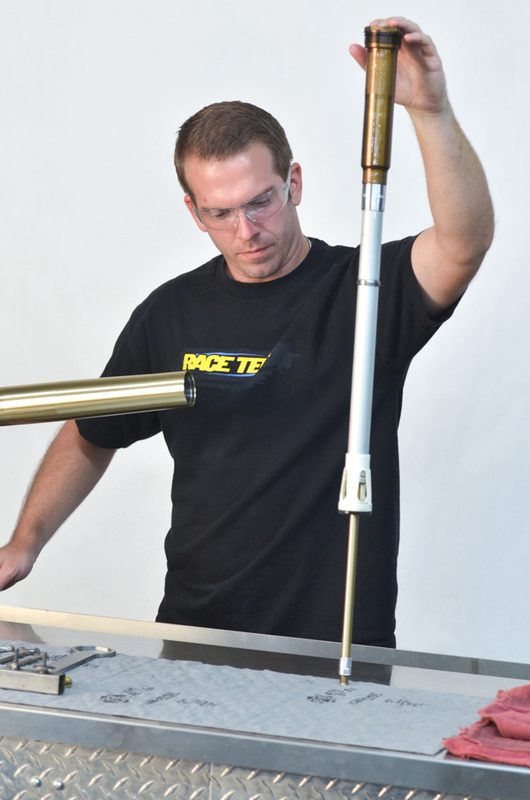 Consult manufacturers specs. The Triple Clamp pressure keeps this from losening. FA26- Set the compression adjuster by counting clicks or turns outwards (counterclockwise) from all the way in (gently). 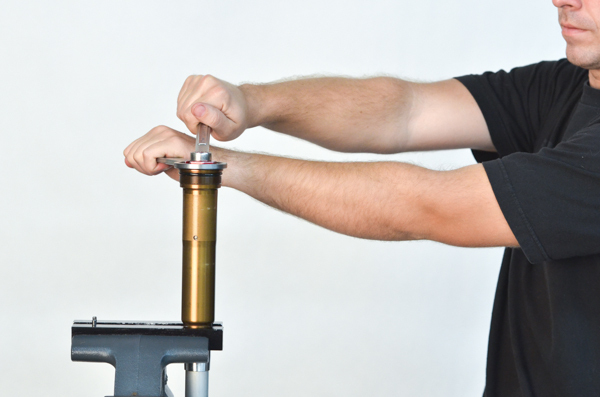 FA27- Set the rebound adjuster on the bottom of the fork leg. Zero is full clockwise (all the way in gently). FA28- Now for the most important step! Install the protective sticker. Be sure to orient the sticker to properly locate the bleed screws on the fork cap. 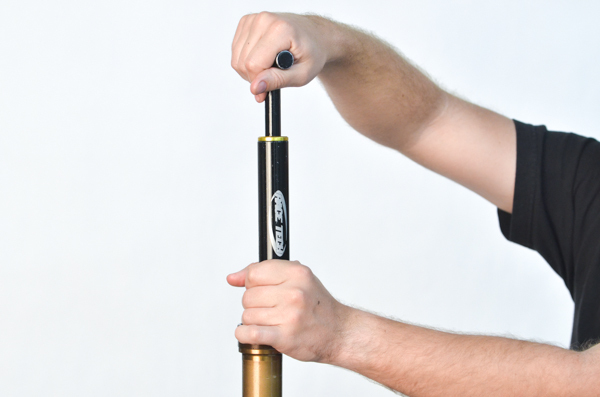 Install the forks on the bike and ride!